Remove the plantains from the oil. Place them on a flat surface and use a rolling pin (or a flat heavy object) to gently flatten the plantains. Return the plantains to the hot oil until crispy and golden brown. Then place on a clean paper towel and set aside. Heat the remaining olive oil over medium-high heat, add the garlic & onions and cook until slightly browned. Then add meat, cumin, cayenne, salt & pepper. Regularly mix meat and ingredients in the pan until meat is cooked through. 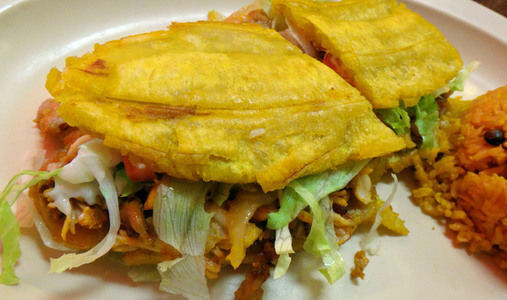 Put the meat and the cooked ingredients on a plantain slice, then add slices of tomatoes and lettuce. Spread the mayonnaise on the other plantain slice and place it (mayo side down) to top the sandwich. Enjoy!